Originally published on steemit.com on 26 January 2018. As many in the EOS.IO development community are aware, we’ve been working since December on merging two lines of development, Dawn 2.x and Dawn 3.0. The merged code base is now stable enough to make public as an Early Alpha and will now become our Github master branch. The prior master will be renamed “dawn-2.x” and will continue to be available as a non-master branch. Community developers will notice that the next time they “git pull” from Master, they will obtain the new Dawn 3.0 code. Those wishing to continue to pull the Dawn 2.x code that connects to the current TestNet can do so by following instructions in the new readme.md, being made available at the same time as the re-mastering. Please note that the Dawn 3.0 code is still in Early Alpha and is not compatible with the current block.one-provided public TestNet; it will not be available in a public TestNet until the end of Q1 2018. In the interim, developers may create their own testnets with the new Dawn 3.0 code. As a reminder, Dan Larimer and the development team have changed the way we forecast development. This means we won’t be announcing the date for the Dawn 3.0 Testnet until the timeline is close enough for us to have high confidence in its capabilities. The current public TestNet at “https://testnet1.eos.io” will continue to run the Dawn 2.x software until the release of the Dawn 3.0 Testnet, and will then be retired. Smart contracts written for the Dawn 2.x codebase will need to be revised to work on the new 3.0 codebase and take advantage of the new features. 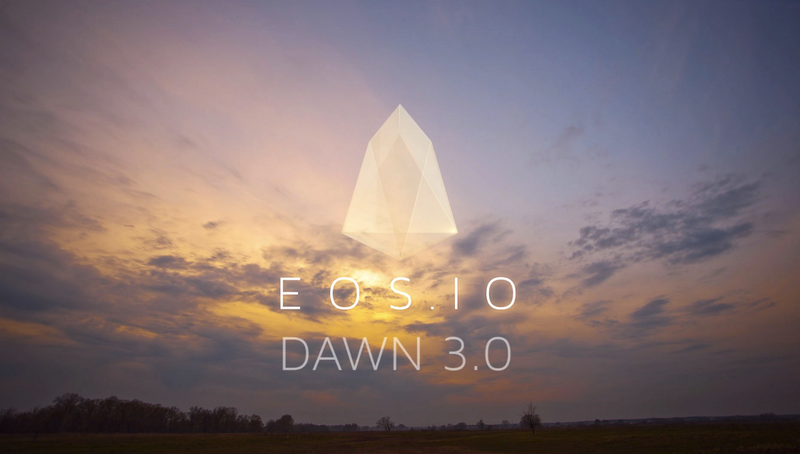 Major changes in Dawn 3.0 include changing “eos” to “eosio” in all locations throughout the code. We have also renamed “message” to “action”, and removed the need for developers to manually specify ‘scope’; all scope specification is now automated. block.one is a software company and is producing the EOS.IO software as free, open source software. This software may enable those who deploy it to launch a blockchain or decentralized applications with the features described above. block.one will not be launching a public blockchain based on the EOS.IO software. It will be the sole responsibility of third parties and the community and those who wish to become block producers to implement the features and/or provide the services described above as they see fit. block.one does not guarantee that anyone will implement such features or provide such services or that the EOS.IO software will be adopted and deployed in any way. All statements in this document, other than statements of historical facts, including any statements regarding block.one’s business strategy, plans, prospects, developments and objectives are forward looking statements. These statements are only predictions and reflect block.one’s current beliefs and expectations with respect to future events and are based on assumptions and are subject to risk, uncertainties and change at any time. We operate in a rapidly changing environment. New risks emerge from time to time. Given these risks and uncertainties, you are cautioned not to rely on these forward-looking statements. Actual results, performance or events may differ materially from those contained in the forward-looking statements. Some of the factors that could cause actual results, performance or events to differ materially from the forward-looking statements contained herein include, without limitation: market volatility; continued availability of capital, financing and personnel; product acceptance; the commercial success of any new products or technologies; competition; government regulation and laws; and general economic, market or business conditions. Any forward-looking statement made by block.one speaks only as of the date on which it is made and block.one is under no obligation to, and expressly disclaims any obligation to, update or alter its forward-looking statements, whether as a result of new information, subsequent events or otherwise.